Lowest prices all the time, guaranteed! If you find a better price, let us know. Aquarius Quilt bedding by C & F Enterprises introduces cool, fresh ocean colors to your decor with seahorses printed in a sponge paint style drifting over sea coral. The pattern is done in shades of green and aqua with blue on a white background. Quilt and shams reverse to a stripe in greens, aquas, and white. Self binding trim at edges. Aquarius comes in a set with the quilt and sham or shams. Add your choice of accessories to style your room. A tailored bedskirt in crisp white and a solid white shell patterned euro sham set off the seahorse comforter and shams. Add throw pillows for extra accent. Three seahorses are printed on one pillow, and another pillow reads "Love You to the Beach and Back". Bedding 100% cotton and machine washable. Pillows are spot clean only. 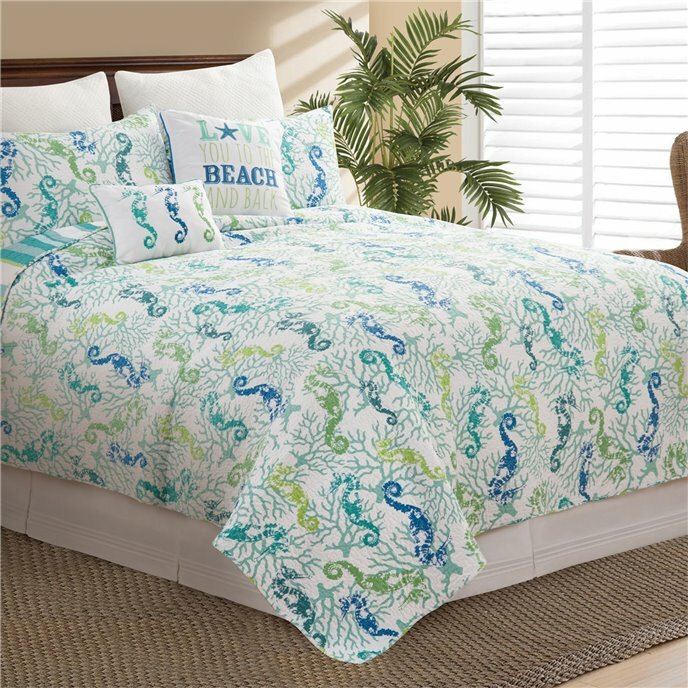 The Aquarius Twin 2 Piece Quilt Set has lots of seahorses printed in a sponge paint look with sea coral in shades of green and aqua with blue on a white background. Self binding trim at edges. Quilt and shams reverse to a stripe in greens, aquas, and white. Set includes one twin quilt, 64"W x 86"L and one standard sham 20" x 26". We offer the complete ensemble in the Aquarius pattern by C & F. Manufacturer's UPC code is 008246509929. The Aquarius Full Queen 3 Piece Quilt Set has lots of seahorses printed in a sponge paint look with sea coral in shades of green and aqua with blue on a white background. Self binding trim at edges. Quilt and shams reverse to a stripe in greens, aquas, and white. Set includes one full queen quilt, 90"W x 92"L and two standard shams 20" x 26". Fits full and queen size mattresses. We offer the complete ensemble in the Aquarius pattern by C & F. Manufacturer's UPC code is 008246509936. The Aquarius King 3 Piece Quilt Set has lots of seahorses printed in a sponge paint look with sea coral in shades of green and aqua with blue on a white background. Self binding trim at edges. Quilt and shams reverse to a stripe in greens, aquas, and white. Set includes one king quilt, 108"W x 92"L and two king shams 20" x 36". We offer the complete ensemble in the Aquarius pattern by C & F. Manufacturer's UPC code is 008246509943. Solid white textured shell pattern. Flanged edge. 26" x 26". Designed to be used behind the standard sham. Beautiful bedding alone or coordinated with many of the other C & F patterns. We offer the complete ensemble in the White Shell Matelasse line by C & F Enterprises. White pintucked box pleated bedskirt adds a tailored finish. 39" x 76". An excellent accompaniment to several patterns by C & F.
White pintucked box pleated bedskirt adds a tailored finish. 60" x 80". An excellent accompaniment to several patterns by C & F.
White pintucked box pleated bedskirt adds a tailored finish. 78" x 80". An excellent accompaniment to several patterns by C & F.
The Aquarius 3 Seahorses Pillow has seahorses printed in a sponge paint look in green, blue, and aqua on a white pillow with aqua binding trim at the edges. 12"W x 16"L. We offer the complete ensemble in the Aquarius pattern by C & F. Manufacturer's UPC code is 008246509639. The Aquarius Love You to the Beach Pillow reads in embroidery "Love You to the Beach and Back" in green, blue, and aqua on a white pillow with blue binding trim at the edges. 18"W x 18"L. We offer the complete ensemble in the Aquarius pattern by C & F. Manufacturer's UPC code is 008246509615. The Aquarius Valance has lots of seahorses printed in a sponge paint look with sea coral in shades of green and aqua with blue on a white background. Straight rod pocket valance. 15.5"H x 72"W. Unlined. We offer the complete ensemble in the Aquarius pattern by C & F. Manufacturer's UPC code is 008246515456. The Aquarius Shower Curtain has lots of seahorses printed in a sponge paint look with sea coral in shades of green and aqua with blue on a white background. We offer the complete ensemble in the Aquarius pattern by C & F. Manufacturer's UPC code is 008246510611.